Native to the tropical and subtropical regions of Mexico to Argentina, the yellow trumpetbush has been cultivated across the southern United States. It can be found in Arizona, California, New Mexico, Texas and Florida. In more northern locations it can be grown as an annual or in containers that can be brought inside during the winter months. Yellow trumpetbush is known for the stunning bright yellow trumpet shaped flowers it produces. The clusters of flowers are pleasingly fragrant, attracting bees, butterflies, and hummingbirds. It blossoms throughout the year but produces most heavily from September to November. Yellow trumpetbush is the official flower of the U.S. Virgin Islands. In Mexico, the roots of this plant have been used to produce beer. It has also been used for a variety of medicinal purposes by herbalists. Indians used to make bows from the wood of the yellow trumpetbush. The scientific name for this species is Tecoma stans. Known widely by the common name of yellow trumpetbush, this plant is also called Esperanza, ginger-thomas, hardy yellow trumpet, trumpet-flower, yellow bells and yellow elder. Although some hardy specimens have been grown as far north as zone eight, the preferred USDA zone for this species is 9 to 11. If grown in areas that are subject to freezing winter temperatures it may die back all the way to the ground during the cold months. Yellow trumpetbush grows in a densely branched irregular shape, with an oval crown. In tropical climates, it may grow to as much as 30 feet in height and width. In the United States it typically only grows to about six feet tall. It can also be grown in the form of a small tree and sometimes does so spontaneously. Full sun is the preferred exposure for yellow trumpetbush. It has a high drought tolerance and as long as there is plenty of sun it will grow. It’s commonly seen growing on rocky slopes, along roadways and deforested areas that are exposed to plenty of sun. Foliage of the yellow trumpetbush is composed of bright green opposite leaves with numerous leaflets. There are an odd number of leaflets arranged opposite each other with a single leaf on the end. They grow up to five inches long and two inches wide and are serrated. The flowers are what this the yellow trumpetbush is known for. 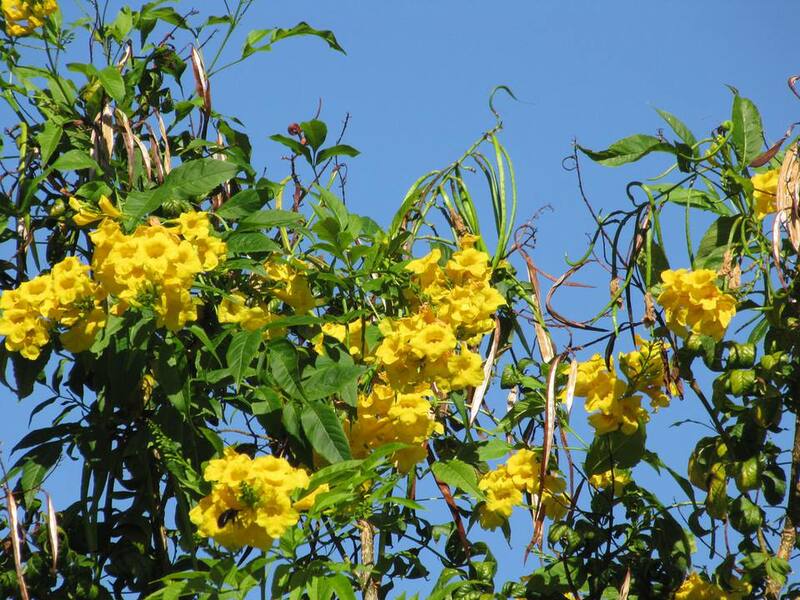 Bright yellow trumpet shaped flowers up to three inches long each is produced in clusters at the ends of the branches. As many as 50 flowers are produced in these clusters. Blooming begins in April and continues to November, with the heaviest flowering taking place beginning in September and continuing until November. Following the flowers, long thin pods are produced that reach up to a foot in length. Initially, they are light green, maturing to a dark olive green. These pods contain many small winged seeds. Yellow trumpetbush does well in rock gardens as well as in perennial gardens. Because it attracts butterflies and hummingbirds it is also popular in butterfly gardens or near hummingbird feeders. They make an attractive shrub border or can be kept in pots on a patio. The most important factor for this plant is sunshine. Yellow trumpetbush adapts to even poor soils as long as it is well-drained and there is plenty of sun exposure. For optimal growth water three or four times each month from February through May. Apply fertilizer once during that period, then again in November. Avoid over-watering this species, as it does not like overly wet soil. Very little maintenance is needed for this plant. Pruning to maintain the desired size and shape can be performed after the heavy fall blossoming is completed. Yellow trumpetbush is essentially pest-free when grown outdoors. When grown in a greenhouse, it sometimes falls prey to aphids and spider mites.